I know sometimes it seems quicker and easier to just grab a broom and sweep across the floor than vacuuming. I used to feel that way my self and there are still times when a broom does come in handy. Like when someone at my house drops a glass that shatters on the floor. We use the broom to gather up the larger pieces for the trash but I recommend that you follow up with a vacuum to get all the tiny little slivers that a broom can leave behind. 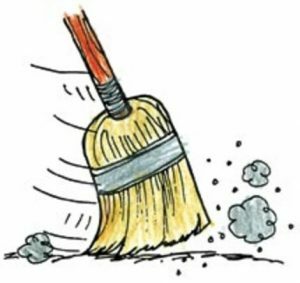 While thinking that a broom may be more convenient for cleaning your hard surface floors consider this; sweeping creates 37 times more airborne dust than vacuuming, causing all that you once walked in or through to invade your breathing space. Stepping on something is one thing, but breathing it in is often just not acceptable. While a dust mop and pad type cleaners seem to cause less dust to fly, vacuuming is still 27% more effective for cleaning hard surfaces. Still not convinced? Since cleaning is a repetitive task that does take time, you should know that dust will return in approximately 24 hours when sweeping vs 72 hours when vacuuming. I’ve read articles on the internet that say you should sweep hard surface floors because vacuums use brush rolls or beater bars that can scratch and damage the floors. Not true. Straight suction vacuums are designed for hard surface cleaning and do not have brush rollers or beater bars. As a matter of fact most all canister vacuums come with a hard surface floor tool. Today’s vacuums come in a variety of sizes, shapes and types. There are uprights, canisters, stick brooms and even cordless. I personally prefer vacuums that use bags for extra filtration and quick and easy clean up. Many models are equipped with hepa filtration, which is especially helpful this time of year as we are seeing pollen everywhere and I want to trap and keep as much as possible out of our home. Hard surface flooring is showing up more and more, but that doesn’t mean it has to be hazardous to your health with more airborne dust or take up more of your time. So pull out your vacuum and enjoy a clean, healthy and happy home.